Let’s start our week with some good vibes and have something to brighten up our Monday morning! Here is Annika’s Rainbow themed party. 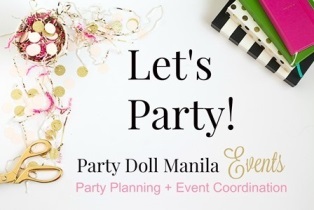 Alma of Pink Tie Party Management and Events lab Ink used lots of bright and cheerful hues that made Annika’s party so color-rific! There are lots of parties that use one or two “color” themes, there’s blue/brown, pink/lavender or mint/gold to name a few. Why choose a color or two when you can use more – throw a Rainbow Themed Party! It’s gender neutral, easy to do and undeniably cheerful. Welcome to Annika’s birthday bash! I love their gorgeous entrance set-up: simple and fun. These colorful streamers and balloons sure brought this theme to life. The stage was decorated with these huge “Annika” letter standee and her cake table. Of course, no rainbow party will be complete without a rainbow cake. They say there’s a pot of gold at the end of the rainbow. Well, I don’t know about that, but in Annika’s party, every table has chocolate gold coins. These miniature ribbon streamers look adorable; it’s so easy to do and sure made a huge impact! They also have different framed quotes about rainbow as part of their table centerpieces. Annika’s candy buffet is bursting with colorful treats! From the rainbow table cloth to the yummy candies, every kid will definitely love this. I’m glad they included these healthy rainbow fruit skewers. Here are some fun and colorful activities to keep the kids busy. Coloring, Glitter tattoo and Face painting galore! Lovely themed-birthday party and very enjoyable event for the celebrant. Really beautiful and colorful, it makes a birthday party lively! I know right! It’s kind of hard to set up a themed party but a rainbow themed party looks easy to make. I love the colors and they really pop! So fun and cheery! Wow! the preparation and everything is amazing… i love the rainbow theme, just too colorful and kids would love it even more. I like the theme of the party. It is not common and very colorful too. Good for the toddlers. I so love the entrance decor…actually, I love the whole theme…so vibrant and colorful! If only these themed party were available during my childhood days then I will have mine be of the “Star Wars” stuff. What a fun set-up! I love themed parties, especially if it’s age appropriate. I think children’s parties are the best themed party. It’s always fun and colorful. Where did you actually get the cake done? I’m looking for a rainbow cake and I cannot find it anywhere in bakeshops. I also have a friend looking for someone who makes customized cakes. Love that rainbow color theme and it’s beautifully arranged. What a colorful party theme!!! Might do same theme next year for my baby boy and girl. Dapat rainbow colors din suot mo sa party!! !